Aeroflot Group enjoyed strong growth in traffic, revenues and profits over the first three quarters of 2013, succeeding both in growing RASK and lowering CASK and bringing the prospect of improving its FY2013 operating margin, after two years of falling profitability. It has led the consolidation of the Russian airline sector, integrating and reshaping newly acquired subsidiaries, and now appears to be reaping the benefits of this government-backed process. The next phase in the group’s progress will be the planned launch in northern spring 2014 of its LCC subsidiary Dobrolet. LCCs have not previously been a feature of the Russian market, but this is changing on international routes. easyJet is now well established from London and Manchester to Moscow; Wizz Air flies from Budapest to Moscow; and Ryanair has obtained permission to fly from Dublin to Moscow and St Petersburg from Mar-2014. Legislation allowing elements of the LCC business model in the domestic market is expected to be passed by the end of this year and Aeroflot is investing USD100 million in Dobrolet to take advantage of this. The Aeroflot Group recorded an 84% increase in net income to USD545 million for the first nine months of 2013. Operating profit doubled to USD850 million on sales up 17% to USD7,033 million, giving an operating margin of 12.1%, up 5.0 ppts. For 3Q2013, growth was even stronger: revenues were up 21%, operating profit up 109% and net income up 88%. The 3Q operating margin was 23.5%, a 9.9 ppt improvement on the same quarter last year. The group’s passenger numbers grew by 15% year-on-year for the nine month period, with ASKs up 16% and passenger load factor up 0.3ppts to 79.1%. This load factor is 1.6 ppts below the 80.7% figure recorded by the Association of European Airlines (AEA) for the first nine months of 2013. Although the Aeroflot Group’s domestic load factor of 78.7% was significantly better than the AEA domestic figure of 71.6%, its international load factor of 79.4% fell short of the AEA international figure of 81.3%. Perhaps this reflects its relative lack of integration into the SkyTeam Alliance. Cargo and mail tonnes carried by the group fell by 6%, in spite of strong growth in the domestic market. Aeroflot ceased operating its freighter fleet, switching entirely to passenger belly capacity for cargo. The group’s principal airline, JSC Aeroflot, outpaced the group in passenger traffic growth, with numbers up 18%, driven by 23% growth in the domestic market. The subsidiary airlines saw combined passenger growth of 8%. Donavia significantly outpaced this, with an increase of 37%, while the two Far East subsidiaries, Vladivostok Air and SAT, merged to form Aurora in Nov-2013, and grew by only 2% and 1% respectively. The largest subsidiary by revenues and passenger numbers, Rossiya Airlines, saw passenger numbers grow by 7%. By region, growth in capacity (ASK) was highest in North and Central America, which saw an increase of 62% in 9M2013 versus 9M2012. Perhaps because capacity grew so rapidly, this region suffered a 3.1 ppt fall in load factor. Europe, Russia/CIS and Asia also saw strong growth in ASKs of 19.4%, 16.7% and 17.0% respectively and load factor also increased in these three regions. In the Middle East and Africa, capacity was cut by 18.3% and traffic (RPKs) fell even more heavily, leading to a 2.8 ppt fall in load factor. Group revenue growth of almost 17% for 9M2013 outpaced growth in ASKs by 0.9%. This was driven by traffic revenues (up 18%), in particular scheduled passenger revenues (up 20% with scheduled passenger revenue per ASK up 3%). Charter revenues grew at a slower rate of 13%, while cargo revenues fell by 11%. Revenue growth accelerated to 21% in 3Q2013, exceeding ASK growth by 6.7%. 3Q scheduled passenger revenues grew by 26%, with scheduled passenger revenue per ASK up almost 12%. By contrast, charter revenues fell by 11% and cargo revenues fell by 30% year-on-year in 3Q2013. Operating costs increased by 11% in the nine month period, slower than growth in both revenues and capacity. Fuel costs were up 11% and non-fuel costs grew by 10%, primarily due to year-on-year increases in aircraft and traffic servicing costs (up 17.9%). 1 Sales and marketing expenses as well as administration and general expenses. Staff costs grew by 12%, with group headcount up 5% year-on-year. This modest increase in staff numbers underlines improved labour productivity, with passengers per employee up 12% and revenue per employee up 15%. Although the 12% increase in labour costs significantly outpaced the increase in headcount, it was less than the increase in ASKs and revenues. 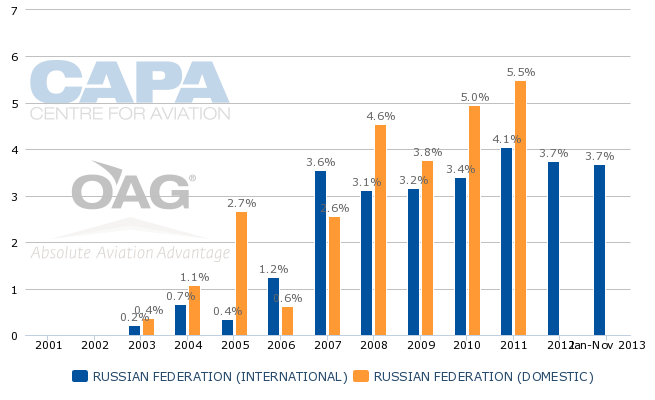 Aeroflot Group’s increase in total revenue per ASK (RASK) of 0.9% for 9M2013, accelerating to 6.7% for 3Q2013, gives it a strong chance of returning to RASK growth for FY2013 after a 5% drop in 2012. There is also cause for optimism on CASK for the year after a 4.6% fall in 9M2013 CASK and a 5.6% fall in 3Q2013 CASK. This positive spread between RASK growth and CASK growth is essential to drive margin increases. In 2007, before the global financial crisis, the group recorded an operating margin of 15.2%, since when RASK growth has not kept pace with CASK growth and operating margin fell to 4.4% in 2012. There was a particularly strong increase in CASK in 2008 and, although this was sharply reduced in 2009, CASK growth outpaced RASK growth from 2009 to 2012. The group’s operating margin was 11.1% in 2010, but this fell to 7.2% in 2011. If the group can replicate its 9M2013 performance for FY2013, it looks set to enjoy an improvement in operating margin versus FY2012. A scatter plot of cost per available seat kilometre (CASK or unit cost) against average sector length for European airlines reveals Aeroflot to lie among the more cost efficient legacy carriers. With a similar average sector length to major flag carrier groups such as Air France-KLM and IAG, it has unit costs that are 20% to 30% lower than those groups. In CASK and sector length terms, the Aeroflot Group is positioned close to smaller European flag carriers such as TAP Portugal and Finnair, although it is roughly three times the size of the latter two in terms of traffic. This gives it a solid base from which to compete with other European legacy carriers, although, importantly, its CASK is significantly higher than those of Europe’s LCCs. *Financial year ends as follows: Jet2.com, Ryanair Mar-2013; Virgin Atlantic Feb-2013; Aeroflot, Pegasus Airlines, Air Berlin, Turkish Airlines, Lufthansa, Aer Lingus, IAG, Iberia, BA, Air France-KLM, Finnair, Norwegian, Vueling Dec-2012; Monarch, SAS Oct-2012; easyJet Sep-2012; Wizz Air Mar-2012. Since the collapse of Avianova and Sky Express in Oct-2011, LCCs have not been a feature of the domestic Russian market. Moreover, LCCs have had only limited penetration of international markets to/from Russia. In the absence of significant LCC competition, Aeroflot’s CASK positioning has allowed it to enjoy fairly healthy margins and traffic growth. Expected legislative developments in Russia permitting the establishment of domestic LCCs and an increase in LCC competition on some international routes to Europe have since placed pressure on Aeroflot to respond. Indeed, in Oct-2013, Aeroflot presented plans to launch its own LCC subsidiary, Dobrolet (originally the name of Aeroflot’s predecessor company), to start operations in northern spring 2014. Legislation allowing LCC features such as non-refundable tickets and separately charged check-in baggage and permitting the recruitment of pilots from foreign countries is expected by the end of 2013. Although many details of Aeroflot’s LCC plans have not yet been made public, it has announced some facts. The carrier will be led by Vladimir Gorbunov and it expects ticket prices to be around 40% lower than mainstream carriers - and that this will stimulate new demand. Adopting classic LCC strategies, it expects to achieve lower costs through seat densification and direct sales channels. In addition, it plans to maximise revenues through the unbundling of features such as checked baggage, priority boarding and catering and to generate ancillary revenues through its website. Aeroflot is planning to base the new airline at a Moscow airport, initially with a fleet of eight Boeing 737-800 aircraft, and to focus on the most popular destinations in European Russia initially. Aeroflot says that it will grow the Dobrolet fleet at an average rate of eight aircraft per year. It expects to invest USD100 million in the new venture in its first two years, a figure that suggests the fleet will be financed mainly through operating leases. According to local media reports, Aeroflot has commenced recruitment and applied for an AOC for Dobrolet. It is also in the process of deciding between Sabre and Navitaire to be its IT partner. Sabre is used by Aeroflot, while Navitaire is favoured by a number of LCCs, including Ryanair, Germanwings, Cebu Pacific, Spirit Airlines, Wizz Air and AirAsia. The choice between the two will be viewed by some as an indication of how independent Dobrolet will be from Aeroflot management. Aeroflot deputy CEO strategy and alliances, Giorgio Callegari told CAPA at its World Aviation Summit in Amsterdam in Nov-2013 that the LCC market is an opportunity for the group, “because it would offer a very large domestic base a competitive service with standards that are in line with the Aeroflot standards in terms of safety, security and customer attention”. Mr Callegari stressed that, as an LCC, the new airline will have a different product positioning: “…Aeroflot is a premium product while the venture in the low-cost arena would offer a more basic product. We believe this will further stimulate a fast-growing market and that’s why we are firmly convinced that the coexistence of Dobrolet within the Aeroflot Group with the other companies will be a successful development”. The new subsidiary will chase new opportunities and is responding not only to the foreign entrants, but is also seeking to pre-empt new entry in its domestic market. Aeroflot generated around USD296 in revenue per passenger in 2012, or EUR230. This was a similar figure to TAP, Finnair and Lufthansa and more than twice the level of most European LCCs. This suggests that Aeroflot’s markets are ripe for price competition and stimulation by LCCs. The plan for Dobrolet to have a 40% price discount would bring it broadly in line with other European LCCs, taking account of its longer average sector length, and is probably the right target level of discount to stimulate new demand. Aeroflot has benefited from Russian Government policy driving consolidation of the Russian airline sector around its national carrier and this is now starting to show itself in growing levels of profitability. Unlike most other major European flag carriers, Aeroflot has been spared the competitive impact of the LCC revolution until now, but this could not be held back forever. The government now appears to be seeking to usher in a new era of LCC-led aviation growth and Aeroflot has been given the opportunity to drive this development in the domestic market before taking it to international markets. Aeroflot is unlikely to have it all its own way: its major domestic competitors, Transaero and UTair have also expressed interest in establishing LCCs - and foreign LCCs could be allowed into the domestic market at some point in the future. Nevertheless, Aeroflot will have a head start if it can execute its plans effectively and learn from the successes and failures of the LCC strategies of other legacy groups. It just might then be one of very few European national carriers to benefit from the advent of LCCs.